We are delighted to announced our Wellbeing content. 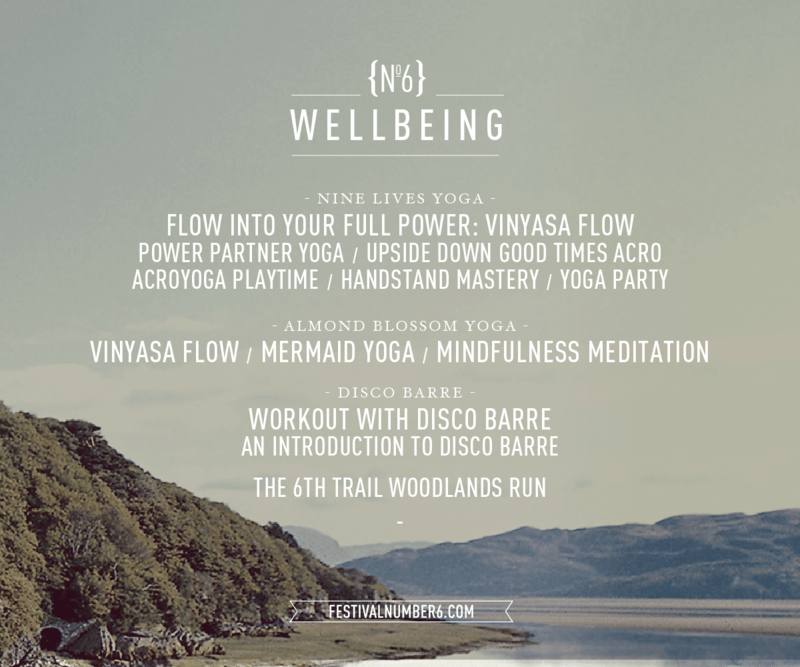 As well as range of free classes, we also have advanced workshops on sale, hosted by Nine Lives Yoga, as part of the Wellbeing offering at No.6. Select your preferred early morning class, which will take part on the beautiful Estuary lawn 8am – 9am daily. This vinyasa flow workshop will work up a wake-up sweat and bring you into a powerful state of being for the day and beyond with Cat Duval of Nine Lives Yoga. Get confident flipping upside down in your inversions, with step by step headstand and forearm balance training, conditioning and waking up the core stability that will keep you with your feet in the clouds all day long with Cat Duval of Nine Lives Yoga. Have fun overcoming those fear blocks and stepping into your true potential with the support of your friends. Learn to spot a handstand to train with at home, bunny hop your hips to the sky and train techniques that will get you feeling safe to bail in the middle of the room and rock your handstands anywhere, even at the bus stop! With Cat Duval of Nine Lives Yoga. Each class is £10, and places are very limited. If you already have booked a festival ticket, log into your customer dashboard below and click on the ‘extras’ tab, or add to you booking when you purchase a festival ticket. View our free relaxing, fun and free Wellbeing content across the weekend here. If you wish to take part in these, please head to the Information Centre in the Village Green when you arrive at the festival.